Similar to the metal flexible connectors in application advantages, single sphere flexible connectors are suitable for pressure and vacuum services. 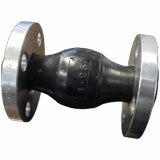 The spherical shape is stronger than cylindrical elastomer connectors and disperses pressure evenly over a larger surface area. The streamline shape also reduces turbulence and sediment build-up and lessens deformation while under pressure. The elastomer allows greater movements in the axial, elongation, lateral, and angular directions and provides a wide service range due to its chemical resistance characteristics.